“It’s raining gays” should have been the title of the 25th Guys4Mountains climb at Mt. Manalmon. Dubbed “Lumamon ng Sinaing sa Manalmon“ the climb drew 22 guys, gals, and gays. Despite the incessant rains, typhoon Marci, and cloudy gray skies hat Saturday morning, the climb pushed through. Honestly, I was hesitant to join and was thinking of backing-out at the last minute. I don’t know how to swim and thoughts of being swept away by the raging currents of Madlum River and making the day’s headlines were a little scary. But assurances from the clmbers came and with the Tita Noey, the one and only Superstar as EL, things can’t go wrong. 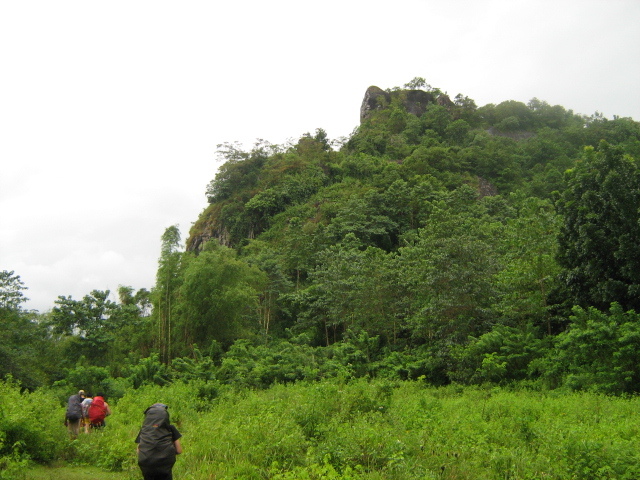 Really more of a hill than a mountain, Manalmon is at the San Miguel side of the Biak-na-Bato National Park in Bulacan. The area is beautiful and there are enough outdoor activities you can do without even going up the mountain. 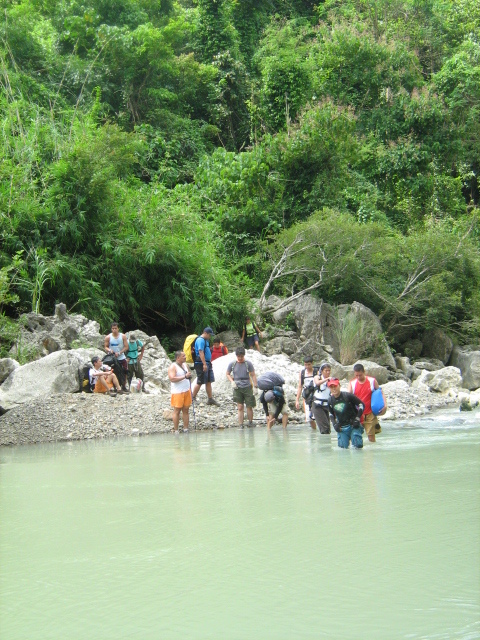 Arriving at the jump-off point, the first challenge is to cross the river. You can do it 3 ways: cross in knee-deep water, take a raft, or for a more adrenaline rush, cross the wire cable. I opted for option #2 because I didn’t want to take my shoes off anymore and #3 kinda looked scary. So we loaded all the bags at the raft. Just when I was about to follow BlueFairyGuy, manong said I couldn’t board as there was too much load already. So I ran to the other end of the river to catch up with a couple of guys crossing to the other side. My sandals were on the raft so I had no choice to cross with boots on but minus the socks. The climb was still set at 3 pm so we had a couple of hours to kill after lunch. I napped while the others swam. Then the rain came and it really really poured. It stopped an hour before the trekk but the ground was so wet and muddy. Into the Cave and Out to the River. The area around Manalmon is riddled with caves. Getting to the mountain, we passed through a short slippery cave. It did make for a unique “sideline” of the trip. For newbies, it would have been an adventure already. Out of the cave and onto the river again. This looked like it needed some serious crossing. One section had raging white water that Ari attempted to cross. We were at calmer parts a few meters from another fast moving section heading towards some rocks. I held onto the pack of Justin. I don’t know how to swim and the water was thigh deep and moving quite swiftly. Mudslide. From the river, it was almost an hour of walking along really really muddy wet trails. I didn’t have a pack with me as I opted for the luxury of a porter. I have never used a porter in my entire life except once last year at the anniversary climb of Sabit in Manabu. I was so wasted at the socials I woke-up with a really really bad and heavy headache and didn’t know how I could manage the slippery trek down. So I got a porter to carry my load. So why this time considering Manalmon has go to have one of the easiest trails ever, even easier than Famy’s? For P 125, I thought it was a chance too good to pass-up. Porters normally cost P 500 such as the one I got at Manabu which is a fairly short and easy trekk. So for such a cheap rate, I decided to treat myself. I almost slipped but managed to grab hold of a branch which poked the side of mouth bruising it and the my gum. I tasted blood. Finally, down a short rocky and wet path, we walked along the river banks until we reach the flat plains at the foot of Manalmon. And there it stood, green and dense with foliage. At 160masl, it looked comically short, like a thumb sticking out of the vast expanse of green. Up and Up and Up. The trail to the camp site was short but steep. With the mud, it was very very very slippery which made for slow going. Dense vegetation shielded any view of the plains below and kept the trail really cool and wet. Finally, after about 30 minutes, we reached the small campsite where a female goat and her 3 babies greeted us. With such a small campsite, it was bound to get crowded. I originally set-up near the socials site but wanting to catch some sleep, I moved tent near the path to the stony outcrop to the peak. It was a decision I regretted as the rocks made for an uncomfortable sleep. Early morning, I hoisted my tent up and squeezed between Leo’s and Saggit’s tents. 5 minutes up some large stone formations and you’re up the peak with spectacular views of the lush forests and countryside. Viewing the river winding through dense foliage punctuated with valleys, only then can you appreciate the expanse of Bulacan. 360 degrees of scenic greenery with nary a sight of anything industrial such as factory pipes (seen in some Batangas mountain ranges) and city lights is just so beautiful and rare. I slept-off socials at a little past 11. We had some new climbers with us so socials was a little raucous. The next day was dry and sunny which made breaking camp easy. Nevertheless even with the sun out, the trails were still wet and muddy and the river still thigh-deep. Since there wasn’t any real bathroom at the jump-off, we had to make do at the river. Since it was a Sunday, there were hardly any locals doing their washing or bathing their carabaos at the river so it was relatively quiet. I like Manalmon coz it’s a real easy mountain to get to. Where else can you find an ascent that lasts for only 30 minutes at wet and muddy conditions? The river crossing and short cave trail makes for an interesting hiking trail.